Manufacturer & exporter of Cam Indexing Systems. 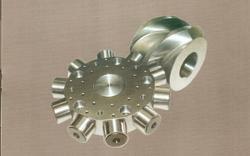 Our product range also comprises of Barrel Cam Indexer SD Series, S.D. Oscillators and Precision Link Conveyors. We are offering our customers a wide range of Cam Drives. Similar size design features of this series of models with a flange-type function and can withstand large axial load and the vertical radial pressure on the drive operation, there is a projection of the fixed disk and the large diameter hollow shaft at the output terminal can be used with the set up dynamic, staticautomation peripherals, power source of electricity, oil, gas and other pipeline can be placed in the hollow hole, this series of models are widely used in heavy load, the various agencies of the low-speed automation equipment and industrial machinery, for synchronization automated intermittent drive. Cam Indexing Systems (FD-120-FLAT) has a groove, which obeys the acceleration control "motion law". The output shaft carries the cam followers, which engage in the groove of the cam. we are offering various range of Cam Indexing Systems keeping in mind requirements of our valuable clients. The Cam Indexing Systems FD-250FLAT are mechanical index tables which convert, continuous rotary input motion into intermittent, indexing output motion. these products are manufactured by using high quality of raw material. Cam Indexing Systems are available in various range with high quality. Cam Indexing Systems are typically used for continuous running application with cams configured to match the indexing transfer and idle times without stopping the motor. The output can be coupled with our shaft to shaft torque limiters or with flange to mount hub-less sprockets. Internal bearings are small in diameter for high speed but located on both ends of the output shaft to support large bending moments. The Cam Indexing Systems is a technological marvel. Most automation in industry make use of this mechanism where in it converts continuous rotary input into intermittent, indexing output motion. As the input shaft rotates continuously, by the geometry of the cam and the follower the output shaft also rotates but intermittently thereby getting smooth and jerk free motion throughout its cycles. Cam Indexing Systems FD-90 are typically used for continuous running application with cams configured to match the indexing transfer and idle times without stopping the motor. The output can be coupled with our shaft to shaft torque limiters or with flange to mount hub-less sprockets. Internal bearings are small in diameter for high speed but located on both ends of the output shaft to support large bending moments. The Cam Indexing Systems FD-200SQUARE are mechanical index tables which convert, continuous rotary input motion into intermittent, indexing output motion. We are offering various range of Cam Indexing Systems to our valuable clients, these products are manufactured with high quality of raw material. The output of Cam Indexing Systems FD-200FLAT can be coupled with our shaft to shaft torque limiters or with flange to mount hub-less sprockets. Internal bearings are small in diameter for high speed but located on both ends of the output shaft to support large bending moments. Cam Indexing Systems (FD-75) has a groove, which obeys the acceleration control "motion law". The output shaft carries the cam followers, which engage in the groove of the cam continuous rotary input motion into intermittent, indexing output motion. We are offering various range of Cam Indexing Systems to our valuable clients. Cam Indexing Systems for Mechanical Industries, these Indexing System are engineered accurately by our competent technocrats using superior technology and raw material. Cam Indexing Systems FD-130FLAT These Indexing System are engineered accurately by our competent technocrats using superior technology and raw material. Owing to their excellent performance these systems add value to the production capacity of the industry these are used. Looking for Cam Indexing Systems ?